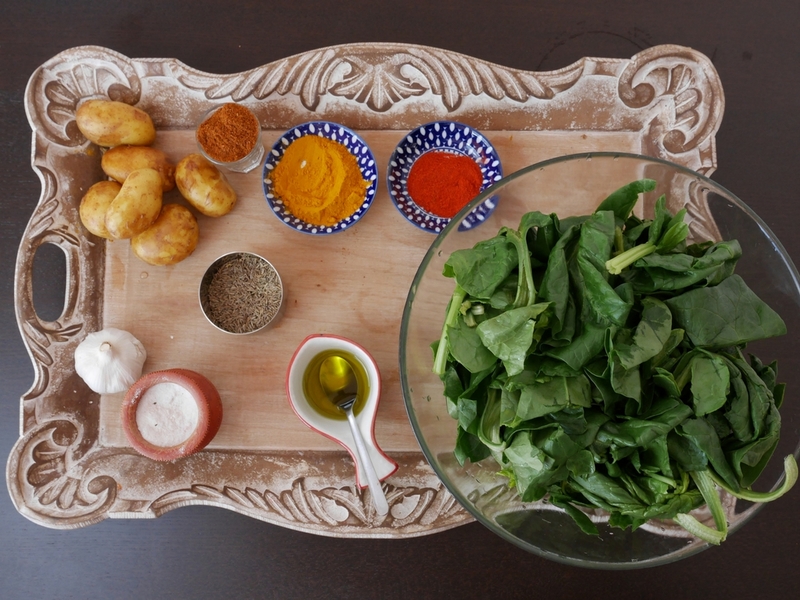 Indian cuisine has many traditional ways to cook spinach, but we want to share with you our simplified version, which is easy to cook and really delicious. This recipe is inspired by a traditional Indian dish Aloo Palak. It features just a few spices (tumeric, chilli powder, cumin and garam masala) and fresh ingredients of the season. You can adjust the spice quantity according to your taste. Step 1. Wash and chop the spinach. Peel the potatoes and cut them into equal size cubes. Peel and cut 2-3 cloves of garlic. Step 2. Put 2 tsp of olive oil in a pan. When the oil is slightly warm, add the chopped garlic and about ½ tsp of cumin. Mix them well and cook about 2 minutes. Step 3. When the oil begins to smell a bit like garlic, add the potatoes, mix them well and cook about 3-4 minutes. Step 4. Now it’s time to add the spinach. If you feel that it’s too much for one time, add only a part of the spinach and continue to cook, after some time you’ll have the space for the rest of it. When you add all the spinach, give it a nice gentle mix, cover the pan with the lid and allow it to cook for about 10 minutes. Make sure that the spinach is not sticking to the pan. Step 5. Check with the knife if the potatoes are cooked. Then add the spices: ½ spoon of kurkuma, some chilli powder according to your taste and some salt. Add some garam masala if you like it. Give a nice mix to spread the spices. Cover the pan again and cook for about 10 minutes. Your spicy spinach with potato is ready! Enjoy!